Where exactly do we draw the line between what we call good and what we call bad? What is it we hope to accomplish by walking a straight path in life? The purpose in this piece is to make the case, that morality is concerned with safeguarding the well being of people and animals (and all else in the universe that is conscious). How are you feeling right now? The end goal of the enterprise of trying to lead a moral life, is to one day find ourselves in a world, where the response we all give this question is something along the lines of “wonderful” (and we actually mean it). When we make the claim that it is right to act ethically, we are making the claim that if everyone behaved in a certain way we would all be better off. The only meaningful conception of ethics and morality is necessarily one focused on the consequences of our actions. Concerned with the principles of right and wrong behaviour. Morality is concerned with the ideas of right and wrong. The implication behind this, is that certain behaviours, intentions and values are in some sense “better” than others. But what is it that makes it so? When we say one act is good and another is evil, how exactly do we make this distinction? To hold a moral compass is to believe there are right and wrong paths to take on the journey of living a good life. The question that remains is; what is the difference between the two? There is no consensus to the answers of these questions, yet how we answer them is major part of what determines how we live our lives (after all our beliefs drive our behaviour). Throughout history there have been many different frameworks of morality and ethics. Since time immemorial we have argued with one another over questions of right and wrong. As ancient as the concept of the battle between good and evil, is the battle over what “good” and “evil” actually mean. Are there actual answers to these questions waiting to be found? Or are we doomed to be debating ethics until the end of time? In reality, what we call nature is arbitrary. Humans formed alongside all else in the universe in the 13.7 billion years since the beginning of time. There is no reason to consider human activity as fundamentally distinct from the rest of the events that occur in the universe, as was discussed in a previous article. Nonetheless, it is interesting to consider how the phenomenon we call morality arises. Is it hammered into us from a young age through what we call culture? Or has it been drummed into our very essence (our genes) over the course of our evolution? Perhaps certain specific moral precepts or traditions are expressions of culture, but morality itself is undoubtedly more fundamental than that. The sheer fact that a sense of morality has independently arisen in every human society in the world should attest to this truth. Actions such as killing, lying, stealing and cheating are seen as unethical actions all across the world. The convergence of moral truths across cultures (despite differences), should demonstrate that there is a deeper principle at work. Is it okay to drink soft drink in class if a teacher says it is? Is it okay to hit another student if a teacher says it is? The action of drinking soft drink feels very different from actually hitting someone. There is a difference between a convention set by an authority and a moral obligation. Being able to recognise this distinction is the line between individuals suffering psychopathy and those that do not. Children not at risk for psychopathy were able to see a clear difference between drinking coke in class with permission and hitting another student. Children at risk for psychopathy found it much more difficult to distinguish the two. The widespread ability of children to differentiate between a moral problem and a mere convention strongly suggests that morality is an innate trait within them that transcends culture. It is not only humans that exhibit moral attitudes and behaviour though, there exist a wide range of studies attesting to this in a range of other animals including chimpanzees, elephants, dolphins, dogs and more. 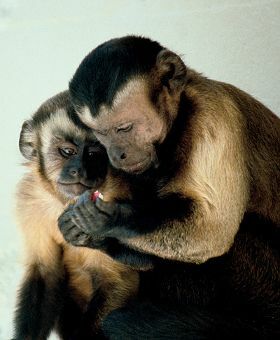 A particular study detailed an experiment that was able to demonstrate the existence of an aspect of morality – a sense of fairness – in Capuchin monkeys. The experiment was set up as follows. Two Capuchin monkeys were placed in separate cages adjacent to one another. They are trained to exchange “tokens” for food. Usually the monkeys are happy to receive a piece of cucumber for this task, but in this experiment one of the monkeys was rewarded with a grape instead (they much, much prefer grapes over cucumber). In other words these monkeys were exposed to pay inequality. Different pay for the same labour – does this pose a problem to monkeys in the same way it does for people? The answer is unequivocally yes, in fact you should watch the experiment in the video below. It is hilarious (and only three minutes). The first piece of cucumber the monkey received completely satisfied it. It only became a problem when it saw its neighbour receive a grape instead. This experiment was later repeated with a range of different animals, including chimpanzees. When this experiment was performed on chimpanzees, even deeper moral behaviour was demonstrated. The chimpanzees that were given grapes often refused to accept anything unless its partner also received them. This is the equivalent of workers refusing to work unless their colleagues receive equal pay – the very foundation of a worker’s union. Moral behaviour exists in the animal kingdom beyond the borders of our species, therefore morality cannot be described as a human trait. Nor can it be described as being in any sense “invented” by us. With everything we consciously strive to accomplish, there is an underlying value. We often choose to eat certain kinds of food over others because we value the experience of consuming them or perhaps we value their impact on our physical health. We may choose to study and learn new things because we value knowledge. We engage in interesting activities such as reading or watching films because we value the emotions they tend to bring about. When we decide to live a moral life, what is it that we value? What are we trying to accomplish in our attempts to be good people? What do we promote in our efforts to do good? What are we trying to protect in our efforts to avoid doing evil? Understanding what we are trying to achieve in our efforts to be moral, is the key to understanding what we mean by morality. Despite there being no widely accepted foundations as to what makes an action right or wrong, there persists a convergence in ethical values across society as a whole. By examining behaviours that virtually everyone considers right or wrong, we can gain insight into what ‘rightness’ and ‘wrongness’ entail. These are some examples of actions considered wrong in every society on earth. There may be disagreement as to when the inevitable exceptions to these rules apply, but the same guidelines tend to be found everywhere. What is it these kinds of things have in common? What is it we are trying to do in avoiding these behaviours and encouraging those around us to as well? Imagine a world in which everyone killed as much as they could, actively tried to deceive one another, stole from one another and cheated whenever possible. It would resemble some kind of dystopia. As many problems this world currently faces, it is trivial to imagine a world many magnitudes worse. In the same sense imagine a world in which everyone was extraordinarily considerate of one another’s feelings, so much so that there was no “my happiness” or “your happiness” but rather each one of us striving for the happiness of all beings. Imagine a world in which the word “murder” was only used in history class, where a person lying to you would be a noteworthy thing (as it seldom happens) where the concept of property did not even exist (everything was free, and not one single person deliberately abused this). If a morally bad behaviours, beliefs or values bring us closer to a dystopia, then a morally good behaviour moves us at least a little closer to a utopia. This might seem like a simple question, but what exactly is the difference between these two? A dystopia is an environment that maximises to the suffering of conscious creatures like us, while a utopia is an environment that maximised their flourishing. Conscious creatures include animals like ourselves and all else in the universe with the capacity to experience. Actions have consequences on the experience of conscious creatures, and whether it promotes or hinders their well being is the dividing line of all that is good and bad. In some of our ancient spiritual traditions, a key reason for living a moral life is to find oneself in heaven as opposed to hell. I see no reason to believe these are actual places awaiting us beyond the realm of our present lives, however they serve as an apt analogy for why it is important we strive to be the best versions of ourselves. Depending on how we play our cards, we can make the inner worlds of ourselves and one another resemble less and less of a hell and more and more of a heaven. This process may already be happening right now. I have absolutely no doubt that there are people all around the world trying their very best to help one another and to make this world a better place. Not only is this true it has been true for a long time. The world of today is rife with a whole host of problems causing millions to suffer needlessly and even problems that threaten our very existence. Despite this, we live in the most peaceful time that we know of. 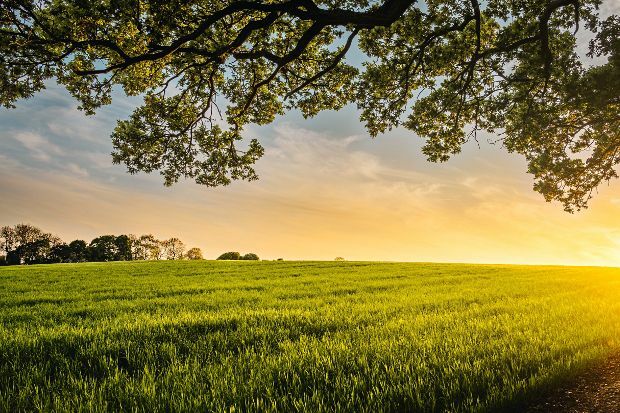 Due to the actions of people of the past as well as the work of those existing now, the world is a far better place now than it was a long time ago. Therefore our actions today matter, what we do really does have the power to to make the world of today and tomorrow a better place to be.